Wandering through the busy streets of Bogota, Colombia, you’re bound to come across some colourful street art. From murals to graffiti, the city has become a hub for urban art, a testament to the artistic freedom that this city awards to its inhabitants. Colombian art has over 3,000 years of history, covering a range of styles and mediums. In the 21st century, Bogota has embraced the modern world and welcomed a new wave of artists and entrepreneurs to its streets. Sydney native, Christian Petersen is just one of the artistic types that have discovered the city. He first visited in 2001 and moved here full-time in 2011. “Colombia is completely different now in terms of security, tourism, opportunities, economics and its global perception,” he says, admitting that in 2001 people often confronted him about why he visited the country at all. But in the face of all that, it was the hospitality of the locals that lured him back. “It was one of the most treasured travelling experiences I’d had in my life, mostly due to the hospitality, kindness and happiness of the people here,” he says. However, it was Christian’s appreciation of street art, that led him to create the Bogota Graffiti Tour, one of the most well-known tours in the country. “When I got to Bogota I was gobsmacked by how prolific and good quality the street art scene was. I was also surprised I hadn’t known this before I arrived,” Christian says. After meeting local street artists, Christian even began painting himself, and along with Canadian graffiti writer, Opek, the Bogota Graffiti Tour was formed in 2011. Christian’s walking tours begin in Bogota’s hedonistic and cultural centre, La Candelaria, a throbbing mass of activity. There is so much to take in here, and the graffiti is just the half of it. During the day the narrow streets are filled with buses, and university students and foreigners emerge from their hostels ready to explore. Street vendors lean against any spot they can find to ply their trade. This is everyday life in this historic neighbourhood. Founded in 1538, the graffiti drags the colonial-style buildings into the 21st century. The reason for the sheer quantity of large murals colourfully plastered on the sides of buildings, and mostly in broad daylight, is because street art is, on the most part, legal in Bogota, but there are a few exceptions. Putting your work on public buildings and monuments is off limits—though people seem to do it anyway—and even then you’re likely to just be slapped with a minor fine and sent on your way. This artistic freedom results in murals depicting political, global and social issues throughout the city. But Christian favours the smaller, more obscure pieces found throughout the city. Following appearances in The New York Times, and other publications, the word has spread and Christian’s tours have become some of the most popular in the country. They now run twice a day in either Spanish, English or German, depending on the guide. Tours are run by donation and tips, with a portion of the funds being injected into events that support local artists. “We recently got involved with a project called Pimp my Carrazo which is a social initiative that helps local recyclers and their families through rebuilding and painting carts with beautiful art. It provides them with health, dental and social support. “We ask for tips and donations based on what people think the tour was worth,” Christian says, adding that generally people donate 20,000COP to 30,000COP ($8 to $13). He also says that their start-up costs were minimal because of the unconventional way they run their business. “It’s a walking tour so we don’t need transport, we don’t have an office and we all do any administration from home or on-the-go from our phones. The tour is very different in this way compared to many established businesses,” he says. Because of this flexibility, Christian is able to spend more time with his family. “My day always starts with getting my daughter up and taking her to jardin (kindergarten),” he says. 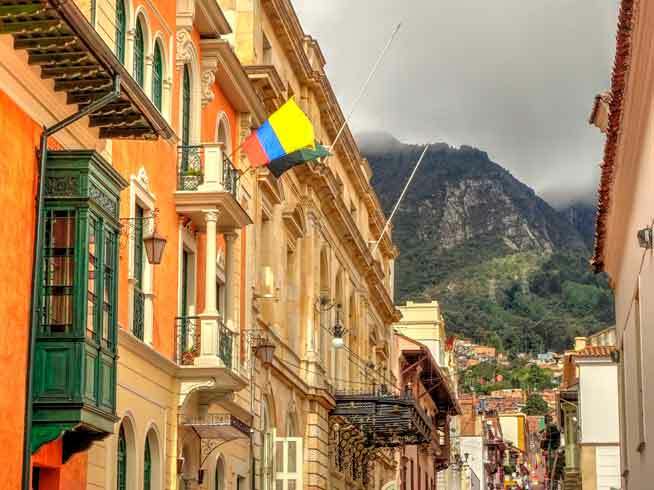 You can live cheaply in Colombia, but you need to do it smartly. “Compared to the cost of living in Australia, it’s a lot cheaper,” Christian says.